Heat dressing in large skillet on medium heat. Add onion; cook 5 min or until tender. Add eggplant; cook and stir 5 mins. Add zucchini, pepper and mushrooms. Cook and stir 5 more mins. Add tomatoes, bring to boil. Reduce heat to low; cover and simmer 15 mins or until vegetables are tender, stirring occasionally. 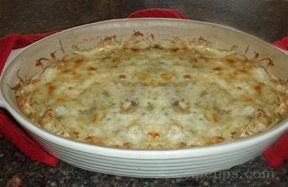 Pour mixture into casserole dish and sprinkle with cheese. Bake at 350° for 25-30 minutes or until heated through. Sprinkle with parsley.